Brazilians are avid smartphone users. 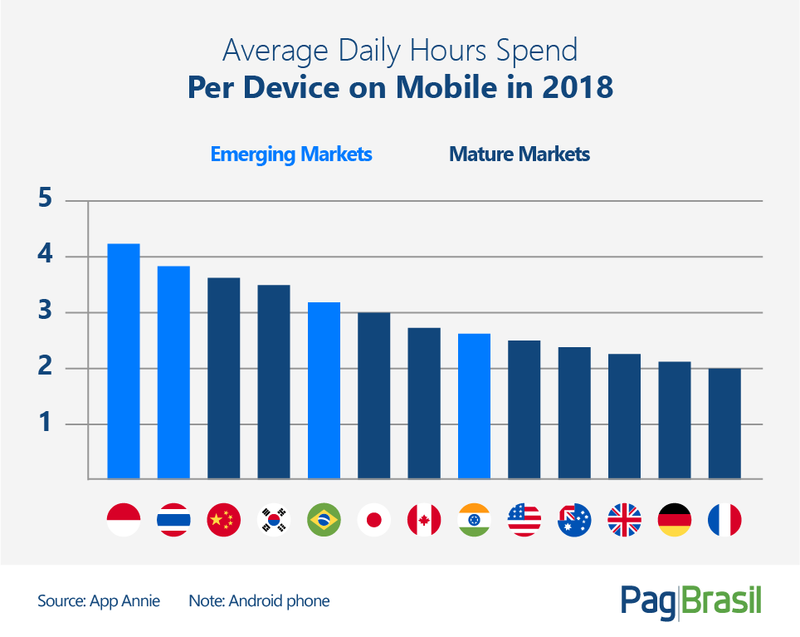 A recent study by Pew Research Center revealed that 84 million adults in the country own a smartphone, which represents 54% of Brazilian adults. However, as families often share one device, eMarketer estimates that 120 million Brazilians access the internet via smartphones. In addition, these devices are the primary source of internet connection for 60% of all internet users in Brazil, as per eMarketer data. Therefore, it is no surprise that Brazil is the 5th country in smartphone usage in the world. 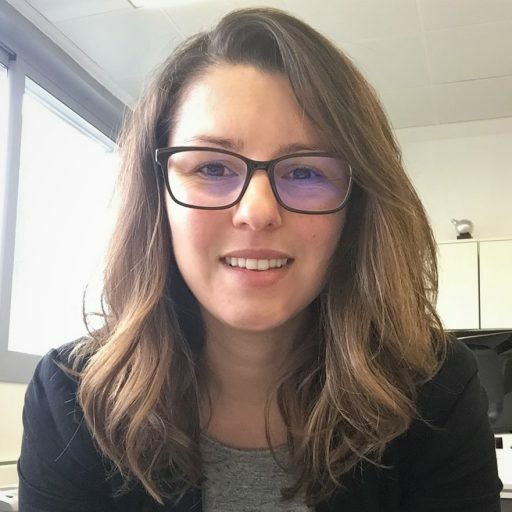 According to research by App Annie, Brazilians spend a daily average of over three hours on their smartphones. This places the country behind only Indonesia, Thailand, China and South Korea. 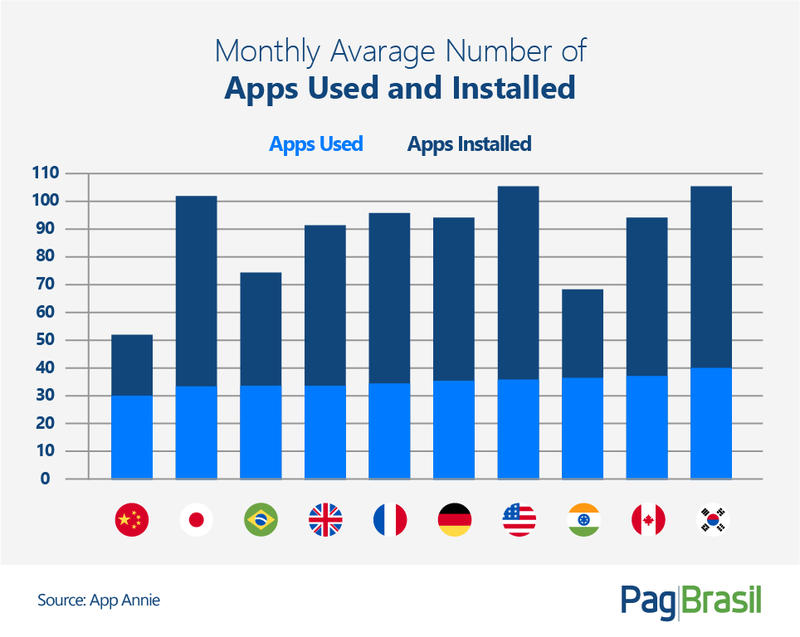 The study also analyzed the average number of apps installed and used in each country. Overall, Brazilians have between 70 to 80 apps installed on their smartphones. However, they use only about half of that, between 30 to 40 apps. 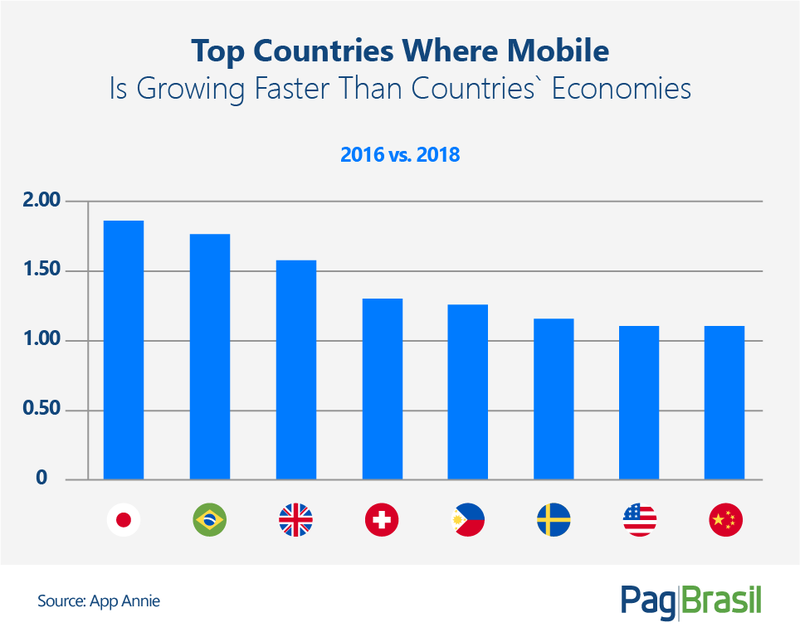 Another highlight from the study is that Brazil is the second country in the world where mobile consumer spend is growing faster than the country’s economy, behind only Japan. 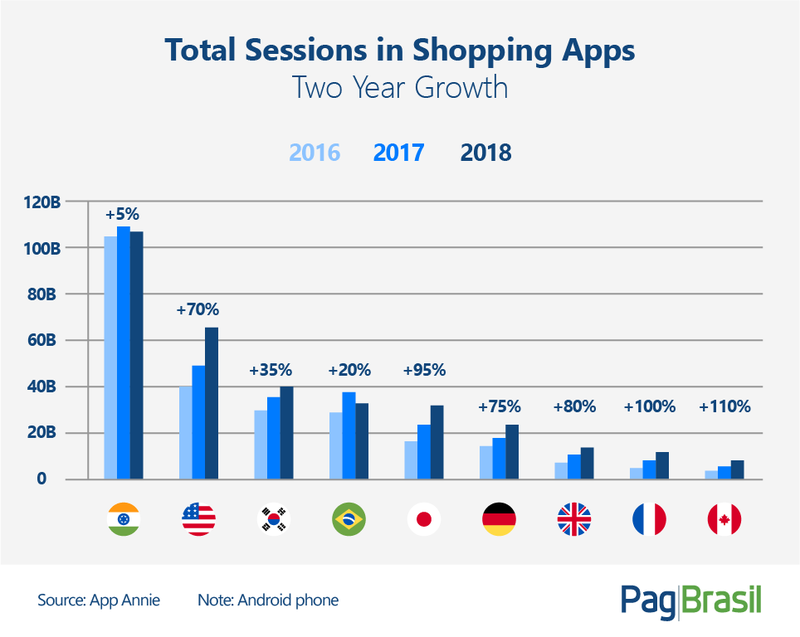 In terms of shopping apps usage, Brazil ranks 4th worldwide, with two-year growth of 20%. The position remains the same when it comes to food and beverage apps, which grew by 45% in two years. Apps such as iFood or Uber Eats have doubled their download numbers, reaching 140 million downloads in the last couple of years. When it comes to mobile banking, the number of downloads increased by over 100%, second only to India. 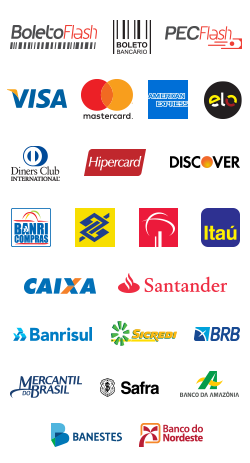 According to eMarketer, 81% of mobile owners in Brazil access their bank account via smartphone app. 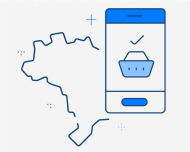 For instance, Banco do Brasil’s app was one of the top 10 most downloaded apps in 2018. Brazilians are also keen to watch videos on their smartphones. 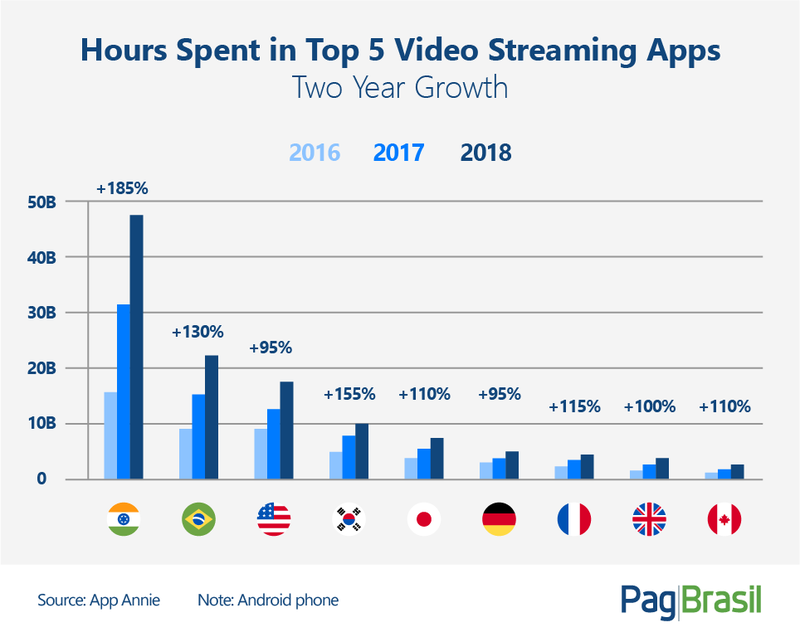 In 2018, they spent 20 billion hours watching streaming videos, an increase of 130% in two years. 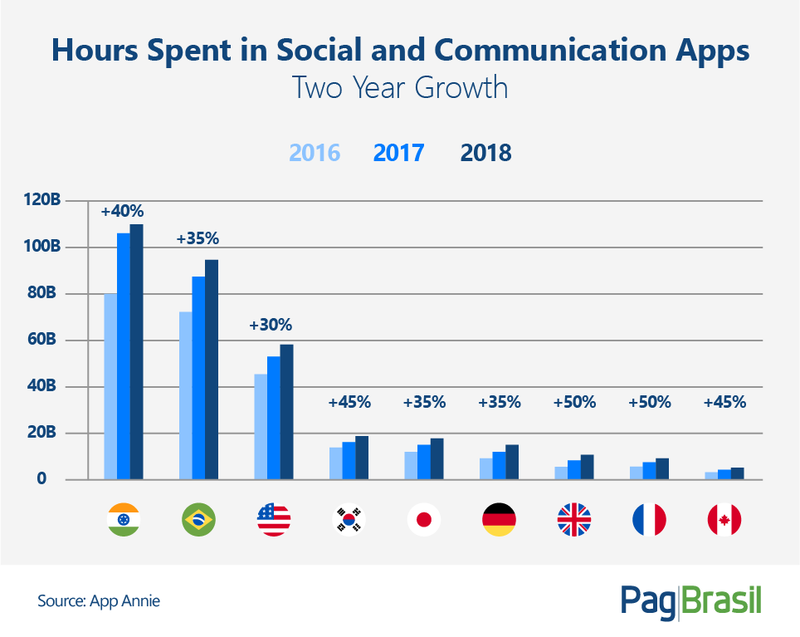 Social media platforms and messaging apps are very popular in Brazil, where people have more than 90 billion hours using these apps in 2018. The top three apps in terms of hours spent using them were WhatsApp, Facebook, and Instagram. Coincidentally, all three of them are owned by Facebook.